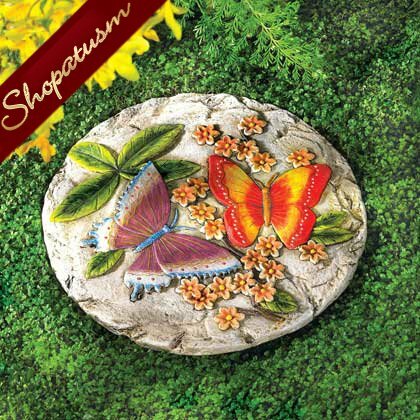 This is for a bas relief butterfly stepping stone, cement garden stone from Shopatusm. A pair of vivid butterflies frolics amongst lush foliage, enlivening a bas-relief stepping stone with glowing colors and romantic sentiment. Sure to be the crowning jewel of your garden. Cement. 11 inch diameter x 1 inch thick.